This adorable black and white party dress has embellished details we love. 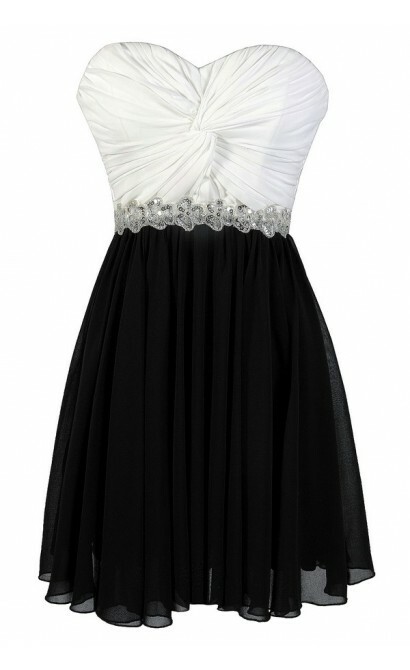 The High Contrast Twisted Chiffon Black and White Sequin Party Dress is fully lined and made of chiffon. The top part has a strapless sweetheart neckline and features a unique twisted design in the front. The empire waist is decorated with a band of silver sequins and seed beads. The attached skirt in contrasting black chiffon has a flowy cut. A zipper in the back completes this dress. The High Contrast Twisted Chiffon Black and White Sequin Party Dress is perfect for your next black tie event! Pair it with black pumps or strappy heels and a clutch or metallic shoes and accessories. This is a great classic neutral color combination you can wear for years to come. Details: Fully lined. Back zipper. 100% polyester. Professional spot clean only. Size 3 measurements: 28". Bust: 30". 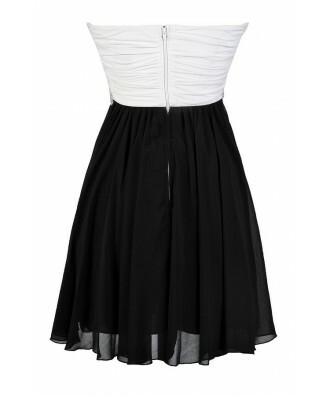 You have added High Contrast Twisted Chiffon Black and White Sequin Party Dress into Wishlist. You have added High Contrast Twisted Chiffon Black and White Sequin Party Dress for Stock Notification. You have set High Contrast Twisted Chiffon Black and White Sequin Party Dress as a loved product. You have removed High Contrast Twisted Chiffon Black and White Sequin Party Dress as a loved product.